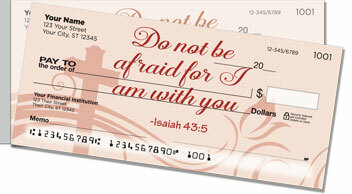 Take the words of God with you wherever you go when you choose these faith-affirming personal checks featuring four powerful scriptures. You already know you should keep the lessons of the Holy Bible close to your heart. Now they can be close to your finances too. 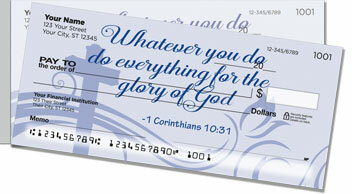 These checks will remind you to be responsible with the many material blessings God has given you, and to trust in Him when times are tight. Bible Verse Side Tear Checks are a blessing in another way. 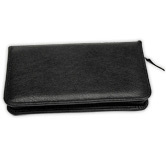 You'll no longer have to worry about checks ripping when you remove them from the pad thanks to a convenient side perforation. 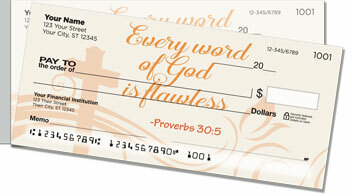 Get your own Bible Verse Side Tear Checks today! 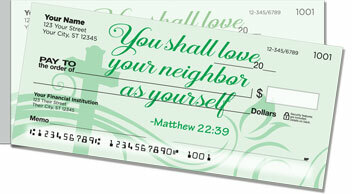 Find matching address labels and other Christian design available exclusively at CheckAdvantage!